Awwww! I cannot start to describe how moved I am by this. Bless them, and you for capturing the moment! For a moment,I thought I was looking at a Norman Rockwell painting…Scott you’ve got a great eye for composition,which elevates your work above the rest! Never so old to learn nor so young to learn. Bring back white stockings for kids! A gorgeous shot. First, the shot is impossibly beautiful. Is she entering the amount she’ll need for Pop-Pop to finance her latest shopping spree? What a beautiful pair. It also seems that the lady may have inherited some of his style genes. Great shot, Sart. Thanks. Ok, I stand corrected there is someone cuter than Jenny . I love this girl’s denim shirt dress, and what looks like her black patent leather shoes. But this photo speaks to me more from a human perspective than a fashion perspective. 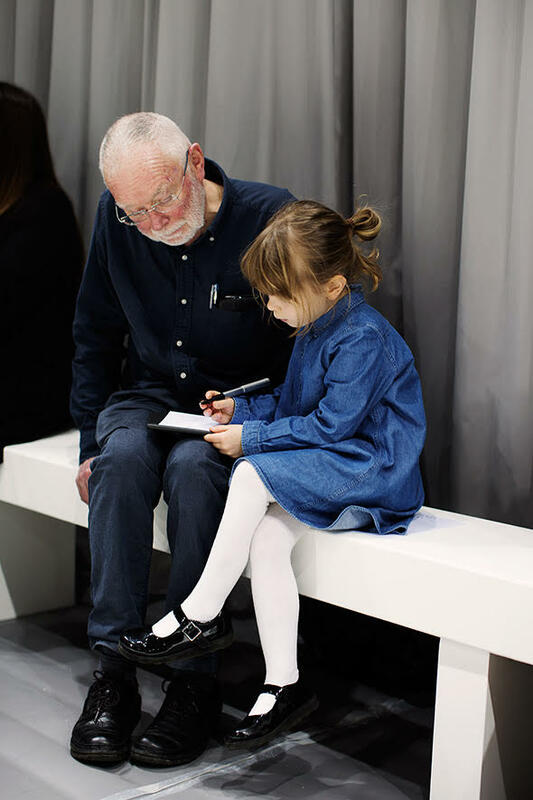 I wonder if the elderly gentleman is her Grandfather – it’s just the way her hand rests lightly on top of his lap, holding a piece of paper or an event program . She is so focused, thoughtful, yet she seems entirely at home where she is. She sits like a mature woman, not like a child. I wouldn’t be surprised if she becomes a fashion designer one day! ..as the youngest CEO in the fashion business i am happy writing out this check to you to please continue with your fine work as our yearlong cobbler of girls shoes..
Lovely! Not surprised you seized the moment. What a subtle, yet striking photo! One could wish that all kids would grow up experiencing many moments like this – where adults put their phones away and just listen. Beautiful! Adorable. The whole thing is perfect. What a lovely catch! Just perfect! 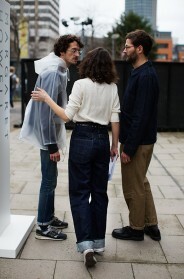 Can anyone tell me which retailers carry Margaret Howell’s clothes for men in the United States, preferably in California? Reminds me of a Norman Rockwell. It’s a very nice moment you have captured. His personal assistant knows how to dress for success. Such natural elegance here – thank you. On the one hand, she’s diligently holding the pen correctly, focused on the instruction, but the legs crossed – already insouciant. This is now my favorite photo on the entire site….. So sweet, love the scene!! Beautiful capture and the clothing styles are so chic too! Young miss is poised to express what seems some clear viewpoint – to an attentive and close audience. Nice one! This is great. The interaction between the two. Fashion Week – See You There Soon?